Aggressive Advertising: A brief analysis on the inevitable outcome of advertising as it becomes more aggressive. Plus advice on whether you should allow aggressive ads on your site. Check your Robots.txt file: A recent upgrade by Google makes it necessary to check your robots.txt file. We tell you what to look for and how to administer any changes. Webcomics.com Poll: We asked our members how many times a week they update. The results were enlightening. Hitch It / Ditch It: We launched a new round of critiques in which we identify one thing you’re doing well and one thing that you could improve. 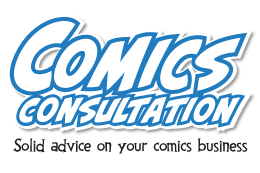 These critiques represent the best opportunities to really delve into the craft of comics. 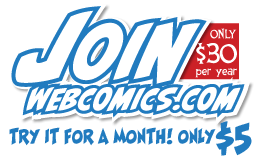 Member Benefit — BannersNStands: At $50 off any order over $179, you stand to recoup almost twice your annual Webcomics.com subscription fee through buying a high-quality item that you’ll use at every convention appearance. Ad Blockers Cost Web Publishers Big: Shortly after my essay on aggressive advertising, a report was released that estimated that ad blockers had cost Web publishers billions of dollars in 2015 — and the year isn’t over yet! 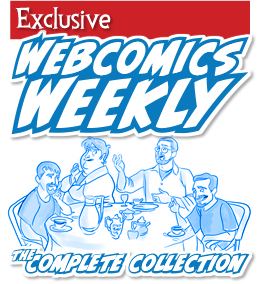 We look at what the researchers found — and what it means to webcomics. Update your PHP: We released an early warning to WordPress users that an upgrade was coming that would make it necessary for them to upgrade the PHP settings on their hosting. We talked about what that actually meant and offered some help in implementing it. Dip the Chip — Or Else: Big changes are on the way if you use a credit-card reader (like Square) to run credit cards at conventions. You may be on the hook for any credit-card fraud perpetrated at your booth! We tell you how to make sure this never happens — and we give you a preview of the new Square chip reader that you won’t find anywhere else. Stop Promoting to Other Cartoonists: It’s the quickest way to prove that you don’t know what you’re doing. Instead of posting an annoying self-promo on a Facebook group for webcartoonists, we give you some usable tips on doing promotion that works. The Case Against Guest Comics: It’s one of my most unpopular opinions: I hate guest comics. I share my thoughts on that, and then open the discussion to the group. Some of them agreed wholeheartedly, and some had some very well-thought-out reasons that I should change my mind. At the end of the day, it’s the m0st informative conversation on the topic you’re likely to find anywhere. Commissioned Sketches; Just Say NO To The Doodle: What do you do when a convention attendee tries to get around your prices for commissioned sketches by insisting that he or she wants, “just a doodle!” You say “no.” Politely, firmly, and (if necessary) repeatedly. We tell you why. Convention Table Signage: Here’s a quick tip on making your convention table more fun and useful to the people who stop by your booth.